I just got a photo from our guys at El Pinto Restaurant in Albuquerque, New Mexico. 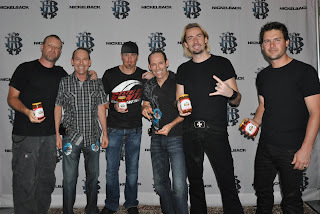 They just met the band Nickelback and sent us this photo of the band, the twins, and lots of salsa. The brothers, Jim and Jon, own the El Pinto Restaurant, which is known to virtually every famous person who passes through Albuquerque. A few years back the brothers started bottling up their salsas and enchilada sauce. The salsas are available at the restaurant as well as Wal-Mart and Whole Foods. The little-known fact is that all the chilis they use are grown organically with EM1 Microbial Inoculant. The guys have also been expanding their use of EM1 on their property, treating all the landscaping and even cleaning the property with EM1 as well as their septic system. (I hope to get up there some time before the end of the year to get some video of what they're doing up there). If you're in the area, make sure to stop by and say hello to the guys. They'll make you feel right at home. And, who knows who you'll see at the restaurant.